We learn to acknowledge and respect everybody’s pain and everybody’s victories, because despite not fully understanding each other’s experiences, we can all agree on a few things: ME/CFS is life draining, heavy, isolating, painful, lonely, misunderstood and just plain horrible to deal with. And none of us would ever choose to have it or wish it upon our worst enemy. I call it a flare when my ME/CFS sends me to bed for a few days, when I can’t function in an upright position for a few days in a row. If I can still function upright, and don’t struggle to move my limbs, then I don’t usually consider it a flare. For a comparison, functioning upright on a good day means being seated, with back and often arm support, drawing or painting for a few minutes or scrolling social media or typing on this blog. It happens in short sessions, sometimes up to an hour at a time if I’m doing really well, but often shorter bursts with rests between. I can move or change position without too much fuss and I can get up for water or toileting without getting breathless and utterly drained. At the end of the day I have a piece of art, a blog post or draft, or a few granny squares crocheted – I have tangible evidence that today was productive. On flare days, that doesn’t happen. I don’t finish anything unless it had already been started and worked on in the days before, but usually my flare days are just me, lying on my bed or sofa with Netflix and naps being the order of the day. This is not a relaxing time, it is filled with pain, discomfort, weakness and shaking. The inability to move without sending my heart rate soaring and becoming breathless. I feel heavy in my limbs, I’m trembling inside and visibly shaking at times, it’s exhausting to move, even just holding my phone is a chore. Talking is hard work, eating literally drains every drop of energy from my body and I just collapse into sleep without warning. It’s like somebody pulled the plug and all my fuel just drained out and I can no longer function. At all. Not only has all my power been drained from my body during a flare, but my ears, nose and eyes become super sensitive. Every rustling of every packet echoes in my brain, confusing my thoughts and disabling my speech. Every tick-tock of the watch across the room (not the clock, the wristwatch) and even my own heartbeat or pulse becomes loud and annoying. Voices, people, movement around me, it all becomes a loud echoing mess in my head. It’s so hard to concentrate or focus on anything. I can’t make decisions. I can’t remember things. Words drop out of my head while I’m speaking and I’m left frustrated as I cannot make myself understood. Just decide for me, it’s easier that way. I can smell garbage decomposing in bins down the street and the sunlight I love so much causes me physical pain. When things don’t taste the way they should, things don’t smell right, and everyday sounds disable me and send shooting pains throughout my body. That is what an ME/CFS flare is like for me. Many of these symptoms are present daily anyway, but during a flare they become so intense, they are all consuming. feeling like you’re about to lose consciousness, I’d hate to go through that alone, but it is a very common part of ME/CFS, so having people around me who are educated about what to expect and how they can help me when it happens is very helpful. For me it is my little sister, she knows what to expect now and how to handle things when I am so weak and incapacitated that I cannot even speak. Avoiding all negativity and drama. Whether it’s people, situations, TV shows, movies, music or negative thoughts and self-talk. It all needs to go. ME/CFS gets stronger when we are agitated or over-excited. I imagine it’s something to do with our nervous system or adrenaline and cortisol levels. Ideally you want to have a safe sanctuary you can retreat to whenever you need to recharge. A calm and quiet place away form television and computers. Away form people and ideally a place with dimmed lighting and a comfortable place to rest. For me, it’s my bedroom. When my family gets too much and I feel the symptoms flaring, I can just go to my room and shut the door. My sanctuary. All I can do when a flare hits, is rest it out until it’s over. Sometimes it’s just a few days, other times it’s months, but you never really know how long it will be. You can make an educated guess based on past experience, but sometimes even that is hit and miss. Learning to accept what is in the moment and have patience till it passes is key to living a stress-free life with ME/CFS or any chronic illness really. I know it is hard for many of us to switch off and rest, we either feel like we’re wasting time, we feel guilty, we feel like we have obligations we cannot turn our backs on, responsibilities to take care of, we cannot afford to stop. Wrong. You cannot afford not to stop. Once we hit flare mode, we must stop and rest because by the time these severely disabling symptoms set in it is already too late and the only thing you will accomplish by pushing through it is to make it worse and potentially permanent. You want to give yourself the best chance of recovery, so you want to rest up as much as possible, specially during a flare, for as long as it takes. When resting, it is best to keep my body warm, I find that it eases my aches and pains and eases the trembling too. I have blankets of various sizes, shapes and materials around the house. Some are fleece, others wool, and others are thinner and lighter synthetic blends. Each has its purpose, whether I sit on it or under it, whether it covers only my legs, my shoulders or wraps all the way round my entire body from head to toe! During winter have found electric blankets or heating pads to be very, very beneficial. Many people love baggy clothes and can’t stand fitted items, but I have found a good medium is best. If the clothes are too loose, then I have too much fabric folding under my sensitive skin or wrapping all around my limbs and it causes discomfort or even pain. If the clothes are too tight, that also causes pain and even itching. I find soft fabrics with few seams to be most comfortable. Elastic bands are better than zips and buttons and no pockets or other flaps of extra fabric necessary. My favourite outfit during a flare is a pair of loose-fitting leggings and stretchy t-shirt. No tight fitting underwear like bras either. Soft socks to keep my feet warm at all times too. I make sure before I move (to go to toilet or get water for example) that I know where I’m going and what I need to do before I come back. Do as much as I can on my one trip, so I don’t waste any energy going back and forth. I might go past the sofa on the way to the kitchen, so I’ll pick up my fleece I had left there, my meds are in the kitchen drawer, I’ll need those soon, so pick them up, top up my water and then make my way back to my room. I make sure I have my phone, charging cables, headphones, sunglasses and blankets all around my bed and easy to reach. This is all unnecessary if you have a carer in the house who can bring you things as you need them, but I find that I prefer to bring things myself and only rely on my sister if I remember something after I’ve already made my trip through the house. It is important to move around every couple of hours, despite the flare, else I get stiff and achy. Moving every few hours helps circulation and strengthens muscles. I eat well and drink lots of water and electrolytes, salt, etc and I make sure I’m taking my 4000mg MSM daily if I wasn’t already at that dose. If I’m in too much pain, then I take Naproxen. I also take a variety of vitamin and mineral supplements daily to help support my body. If the flare lasts for weeks and the pain becomes too much, then I go back on Amitriptyline with the Naproxen, but fortunately that hasn’t happened since I’ve been on the Keto diet. Pain levels are now almost zero and 1 Naproxen usually zaps any pain that does flare up occasionally. 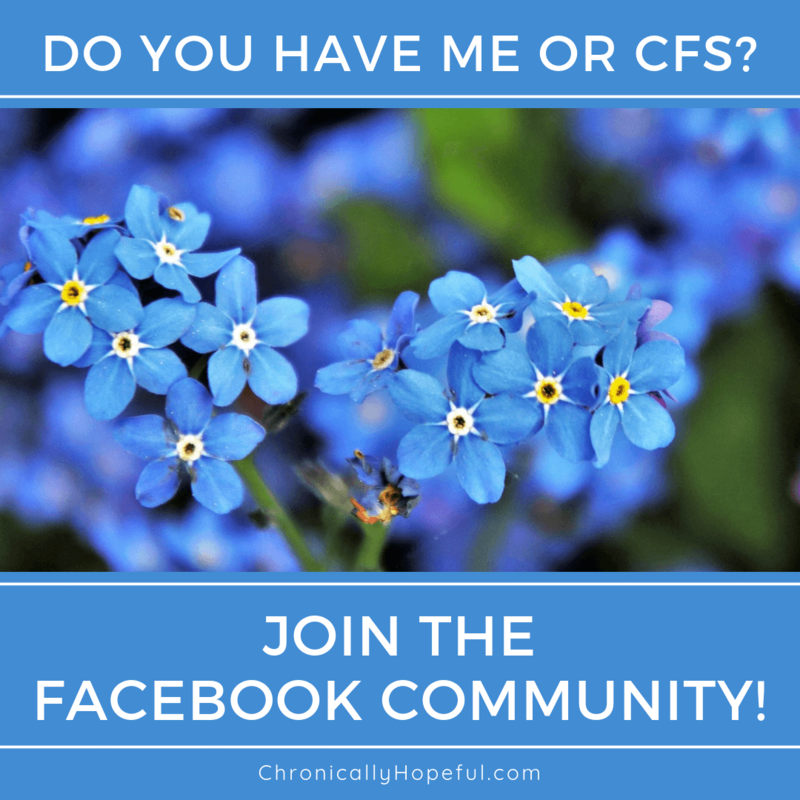 Everybody responds to things differently with ME/CFS, we are not all the same, so it’s important to try different methods and find what works best for you. I hope that by sharing my methods I can inspire you to try some new approaches and hopefully help you find your ideal recovery plan. How do you handle your flares? What are your top tips for reducing your risk of flares? What is in your survival kit that you keep near you while confined to bed?